Have you ever wondered what it would be like to spend your days on the bay, hauling crab pots or dredging for oysters? Get an insider’s look at the life of a waterman, and learn about other people who worked the laborious seafood packing industry. At Maryland’s maritime museums, you can also see, touch and experience the Chesapeake Bay’s marine creatures up-close and discover how they live. And this is just the beginning . . . there’s so much more to explore. For an authentic Maryland experience, get out on the water with someone who lives the waterman life, rising before dawn and working the Bay to bring delicious Maryland seafood fresh to the docks. Try a Watermen Tour, which will immerse you in Chesapeake culture and offer an adventure full of surprises. Welcome aboard the port city of Annapolis. Come discover how the men and women who lived and worked here were dependent upon the water for transportation on all types of vessels. 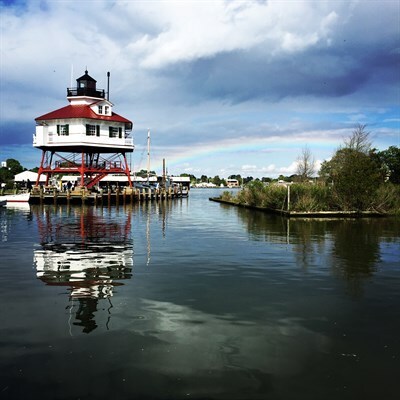 Take a guided boat excursion to the Thomas Point Lighthouse, which sits several miles out in the bay, for an authentic Chesapeake experience. Housed in the original canal pump house complex, the C & D Canal Museum includes a working model of a water wheel and a canal lock. Paintings, maps, documents and artifacts showcase the history of the canal waterway. Sail on the William B. Tennison, a “bugeye”-style boat on the Patuxent River. Discover the process of harvesting and packing oysters at the historic J.C. Lore Oyster House, and see river otters and other marine life at play in the museum. Small-craft collections and the Drum Point screwpile Lighthouse are also main attractions at this hands-on tidewater museum in Solomons that’s fun for the whole family. Meet real people of the Chesapeake who work on the water or depend upon the bay for their livelihood. Decoy carvers, crab pickers and boat builders are some of the locals who you can meet here. Watch the restoration of the bay’s traditional vessels in the museum’s working boatyard. Learn how people have depended upon the bay for centuries and continue this interaction through waterfowling, seafood harvesting, naval history, recreation and more. Located on the waterfront at the Somers Cove Marina in Crisfield, the museum features displays on Lower Shore history, the Chesapeake Bay’s beginnings, the influence of Native Americans on the early colonists, seafood harvesting and processing, and decoy carving and painting. See the artistry of waterfowl decoy carving and discover its history and how the decoys were used for hunting on the Susquehanna Flats. A variety of carving and hunting styles and techniques are on display to study the finer aspects of this folk art. A working boat shop and environmental center are attractions in this museum that features the history and ecology of the Upper Chesapeake Bay. Located on the Susquehanna River, the museum also interprets a canal that served central Pennsylvania from this area. A maritime gallery displays 1,000 objects, including half hulls of ships, ship models, maritime-related navigation tools and trail boards. The “Maryland: Mountains to the Sea” exhibit displays aquatic animals living in mountain stream, tidal marsh and coastal beach habitats, including bullfrogs, diamondback terrapins, striped bass and the iconic blue crab. The aquarium offers numerous other exhibits with live animals in their simulated native habitats. Come explore! Located in the heart of Cambridge, this museum invites you to discover the wooden boat building heritage of the region. A unique collection of traditional Chesapeake Bay wooden ship models brings that heritage alive. Learn the skills of boatbuilding at the Ruark Boatworks facility where you can watch boatbuilding and restoration in action. Major exhibits include displays of boatbuilding tools and watermen’s equipment and gear used to dredge and tong for oysters, scrape or bait crabs, and trap eels and fish. Museum exhibits explore the voyage of Maryland’s first colonial settlers who came from the Isle of Wight, England to St. Clement’s Island in the Potomac River in 1634. Other displays share the Potomac River’s heritage, including the Blackistone Lighthouse on St. Clement’s Island, and the industries of hunting, crabbing, fishing and oystering. Based in Chestertown, the foundation provides hands-on educational programs for children and adults focusing on the history and natural environment of the Chesapeake Bay watershed. Public sails aboard the Schooner Sultana, a full-sized reproduction of the 1767 vessel, explore the Chester River where passengers are encouraged to help sail the vessel and explore the authentic crew’s quarters below deck. Themed public kayak paddle programs visit a variety of habitats on the Eastern Shore. This museum interprets the heritage and lifestyle of the waterman and hunter on the Upper Chesapeake Bay and the famed Susquehanna Flats. Commercial waterfowl hunting helped support the communities that grew around the Bay. This history is brought to life through exhibits as diverse as outlawed gunning rigs and skillfully carved decoys. On display are an extensive collection of hunting, boating, and fishing artifacts. Smith Island has been called “The Chesapeake Bay’s Best Kept Secret.” Here you can truly unplug and unwind to experience life on a secluded island. The cultural center explores the island’s self-sufficient, hard-working lifestyles and the close-knit communities comprised of descendants from the island’s original 17th-century English settlers. Discover why this place is the heart of Maryland’s soft shell crab industry, and its claim to fame is Maryland’s state dessert. In this working waterfront town, local residents made their living from the water in decades past and still do today. See the tools of the trade and learn about their lifestyle through displays on oystering, crabbing and fishing. A reproduction crab shanty house is a highlight.